As reported in today’s D & C Signs in the works to explain contested carousel image, interpretative signs offering historical context will be added to the Ontario Beach Park carousel that features two caricatures of African-Americans. According to county spokesman Justin Feasel, the signs will be installed in time for its opening on Memorial Day. Last August the panel became a County Executive election campaign issue. Democrat Sandra Frankel and Green Party Rajesh Barnabas called for its removal and placement in a local museum if viable. Although Republican Cheryl Dinolfo took no public position, apparently she supported the Brooks administration’s decision to keep the panel at Charlotte but to include the interpretative signs. Our plan, from the start, was to use one of these showcases to highlight artifacts that have sparked national discussions. It seems to me that the carousel panel is an ideal fit for one of the cases. We would tell the story of the panel’s origins–and, the ensuing controversy surrounding the object. I believe that it would be a wonderful teaching tool, if donated to the Jim Crow Museum. At that point, I asked the three campaigns if they supported donating the panel to the Jim Crow Museum. I would prefer the panel be in a local museum. However much I like the concept of giving the panel to the Jim Crow Museum, displaying it there may be a a case of “preaching to the choir.” If the panel is kept locally, for example the RMSC, people of all political stripes might catch the exhibit. The idea is to have conversations and action; this won’t happen if it goes to the Jim Crow Museum, at least not in Rochester. Who will see it? None of us. History is most impactful if it is localized. As a social studies teacher I always tried to teach in to out. First know what is happening in your community, now! What is your local history, then see how that attaches to the rest of the scene. The panel has to stay local, just not on the carousel! As I reflected, I agreed. The panel should stay in Rochester. At the same time, the very fact that the Jim Crow Museum–a highly respected institution–wanted to make the panel a showcase piece detonates any argument that the panel is somehow not racist. The Landmark Society is researching and preparing the contents of the interpretive signs. I suggest they consider including mention of Dr. Pilgrim’s serious interest in bringing the panel to his museum. Nonetheless, the question remains, if not moved to a local museum as preferred by Frankel, Barnabas and me, should the panel stay on the Carousel or will the interpretive signs suffice? County Executive-elect Dinolfo can get ready for a very rough ride regarding this particular issue. Our unequivocal position is, as it has consistently been since the time that the thoroughly racist, white supremacist-based, pickaninny, garbage ‘art’ was first brought to our attention in July, that the panel must come down — period. To me, Eagle’s position is too extreme and misses the very possibility of a “teachable moment” the text offers. Eagle should first write what he deems an appropriate text and submit it to the Landmark Society. Furthermore, as for the panel going to the RMSC, that remains a possible future option. In August, I spoke with Senior Director for Collections and Exhibits Kathryn Murano Santos, who provided an unofficial account of the museum’s position. We would be happy to enter into discussions about the carousel panel coming to the RMSC. Our President, Kate Bennett, is involved in the movement to remove the panel from the carousel through her work as Co-Chair of the Facing Race, Embracing Equity (FREE) initiative and would like to better understand the community’s feelings regarding the panel’s appropriate disposition. Bennett supports exhibiting the panel at RMSC if there is general agreement that displaying it in a local museum context creates a teachable moment in the stand against racism. Of course, we also recognize the importance of developing an exhibition strategy that clearly articulates community concerns about the panel and the reasons for its removal from the carousel. To me, the RMSC is an ideal setting for the panel. 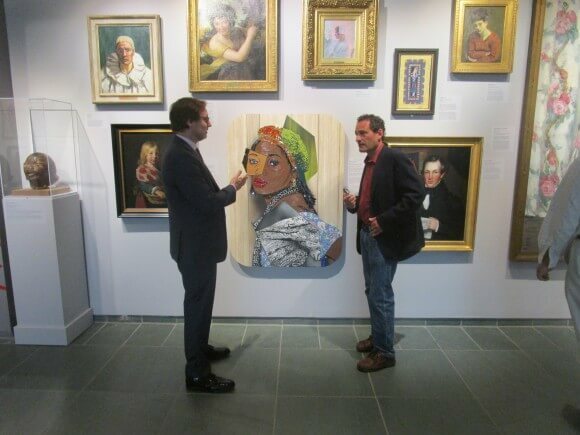 Also in August, I spoke with Jonathon Binstock, Director of the Memorial Art Gallery. Thoughts on why the carousel panel belongs in the Jim Crow Museum of Racist Memorabilia Giving me a tour of the Gallery’s art by and about African-Americans, Jonathon explained why the panel is not suited for the MAG. Another option for the Jim Crow Museum could be to take a high resolution digital photograph of the panel and create a graphic facsimile for display and interpretation at their location. While the density of information is never as robust as the original object, a reproduction can create an effective prompt for visitor dialogue. In conclusion, an explanatory text is a fitting response to concerns about the panel. The text should provide historical context on the use of early 20th century African-American caricatures in popular art. But the text should not equivocate on how today the panel can only be seen as racist — especially when the Museum of Racist Memorabilia wants it! As for Howard Eagle, write your text and we’ll publish it here first.